Increasingly, we are seeing people move towards a vegan life, which includes the products they use. 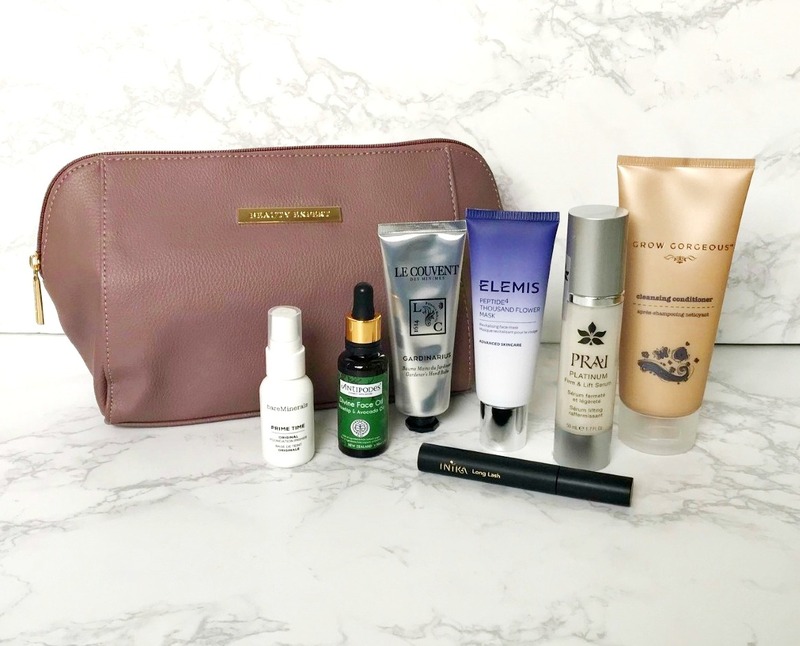 Beauty Expert has created an edit of seven best selling premium vegan beauty products (full sizes), all housed in a stylish vegan wash bag with a retail value of £180 but a price tag of only £80. I think it would be a brilliant gift regardless of whether the recipient is vegan, but especially for anyone who is starting to embrace a cruelty-free lifestyle. So, what's in the bag? A nice mixture of skincare, bodycare, makeup and haircare. Antipodes Divine Avocado and Rosehip Oil: If you read my Antipodes Brand Focus post, you will know that I am a massive fan of this oil. It really plumps and nourishes the skin, increases elasticity and helps to heal the skin. Elemis Peptide4 Thousand Flower Mask: Who doesn't want glowing, radiant skin, which is what this mineral and vitamin-rich mask delivers. A spa like experience with the added benefit of being cruelty-free. Prai Platinum Firm & Lift Intensive Serum: Formulated with Chlorella and Kombuchka, this anti-ageing serum strengthens the skin, encouraging collagen production and improved elasticity. I find that it layers well with other products without any pilling and feels comforting on the skin. Grow Gorgeous 11 in 1 Cleansing Conditioner: I adore this brand as every product smells amazing and contains biotin, which encourages hair growth. This doesn't leave any heavy residue in the hair and is gentle enough for daily use. The 11 benefits of it range from boosting volume and adding shine to reducing frizz. Le Couvent Des Minimes Gardener's Hand Balm: This balm absorbs quickly, so there is no down time, but it's very nourishing as it contains shea butter. It has a beautiful citrus scent, which is uplifting and a little goes a long way. Inika Long Lash Mascara: This mascara feels weightless on the lashes and gives definition and length, rather than volume. I love that the brush allows every last lash to be coated! bareMinerals Prime Time Foundation Primer: This is a brand that I have yet to try a lot from but from what I have tried, I think the products are perfect for sensitive skin. This primer is infused with Vitamin E, which feels soothing and nourishing and it creates a smooth base for foundation. The bag that all of these products are housed in a luxe and sturdy wash bag, which will be perfect for travel. Overall, this collection is amazing value for money - £180 of products for only £80! If you are interested in incorporating more green products into your routine, you can go wrong with this collection. Are you tempted by this? What would be your favourite product to try from the collection? All products are bought by me, unless otherwise stated. This set was kindly sent to me but this is not an ad as I was not paid to post about it. Opinion is always my own. Affiliate links may be used.